Who needs Android apps when you've sold more than 200 million licenses for your software? Microsoft boasted that figure today in relation to Windows 8, noting in a statement that as the OS passed the 200-mill mark, it continues "to see momentum." "This number includes Windows licenses that ship on a new tablet or PC, as well as upgrades to Windows 8," the statement continued. "The figure does not include volume license sales to enterprise. Windows is a central part for more than 1.5 billion peoople around the world, and we are looking forward to the future." Microsoft EVP of Marketing Tami Mueller first dropped the figure during the Goldman Sachs Technology & Internet Conference earlier today. It's the first we've heard about Windows 8 sales figures since Microsoft revealed they'd reached over 100 million on May 6, 2013. Is that figure all it's cracked up to be? Back in May, Microsoft said W8 reaching that figure was on par with Windows 7 license sales during its first six months on the market, according to ZDNet. To date, Windows 7 license sales still outpace Windows 8. The older version of Windows reached 240 million license sales in its first 12 months on the market, while it's taken Windows 8 15-plus months to hit 200 million. Not to pour cold water on Windows 8, but it clearly hasn't been snapped up at the clip of W7. 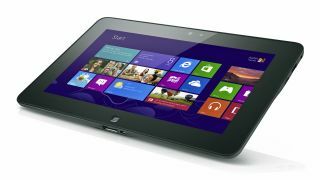 Still, with a Windows 8.1 update reportedly due in April and Windows 8.2 and Windows 9 relatively right around the corner, the Windows ecosystem may generate jaw-dropping steam yet. Mueller referenced the "more rapid cadence" the Windows team has adhered to lately, and said there are "more things coming just around the corner" during her talk at the conference. We expect some sale-stimulating news during Build 2014, though it's doubtful Windows 8 will have caught up to Windows 7 by then. Will Nokia's Android phone be a one-off? We may be in for many more.